In 2011, a friend of mine had passes to see The Help and asked if I wanted to go and see the movie with her. I took one look at the poster and said, “No thank you.” After hearing the glowing reviews of the movie, I contemplated giving it a shot, but I couldn’t shake the feeling of dread that gnawed at the pit of my stomach. In 2013, movie reviewers tackled 12 Years a Slave. They said it was a powerful movie, a must-see despite it being hard to watch. That dreadful feeling in the pit of my stomach returned with a vengeance, damn near clawing at my insides every time I heard someone talk about this masterpiece. I still couldn’t come up with the words to describe what I was feeling, so I did the one thing that always came to mind when I couldn’t figure something out. I called my mom. “Are you gonna go see 12 Years a Slave?” I asked her. “Girl, no. I’m so tired of movies like that,” she said with pure sincerity, following it up an ongoing list of the movies like that she’d seen in her 60 years of living. There’s something to be said about the kinds of movies you’re expected to watch, especially if you’re a woman of color. In 2011, it was The Help, and my (white) friends couldn’t quite comprehend how I would pass on a good movie with charming black female characters who, apparently, have an amazing scene that involves a certain kind of pie. In 2013, it was 12 Years a Slave, and my (white) friends couldn’t quite comprehend how I would pass on such a groundbreaking movie that really showed the brutality of slavery. In 2016, it was Birth of a Nation, and (black) men took to social media to proclaim the necessity of supporting the movie, reminding us to always, always, ALWAYS support black films, discomfort be damned. After all, it wasn’t like any other black-led movies had come out that year that we could support (cough cough Queen of Katwe cough cough Moonlight). But there, in the far reaches of Earth’s orbit, was the unexpected gem that reinvigorated me. So instead of a general review, I’m going to break down why this movie matters and point out scenes that reflect my thoughts. #BlackGirlMagic in a single poster. 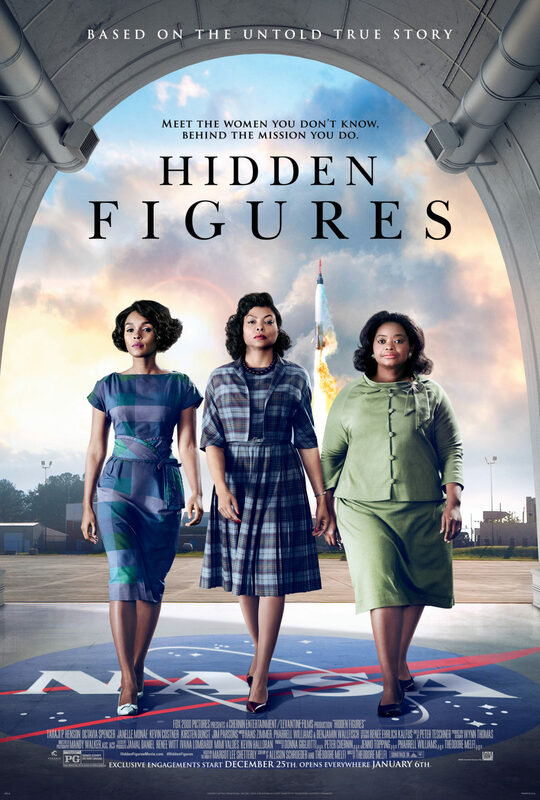 This is the story of three black women: Katherine Johnson, Dorothy Vaughan, and Mary Jackson. Do you know who’s on the poster? 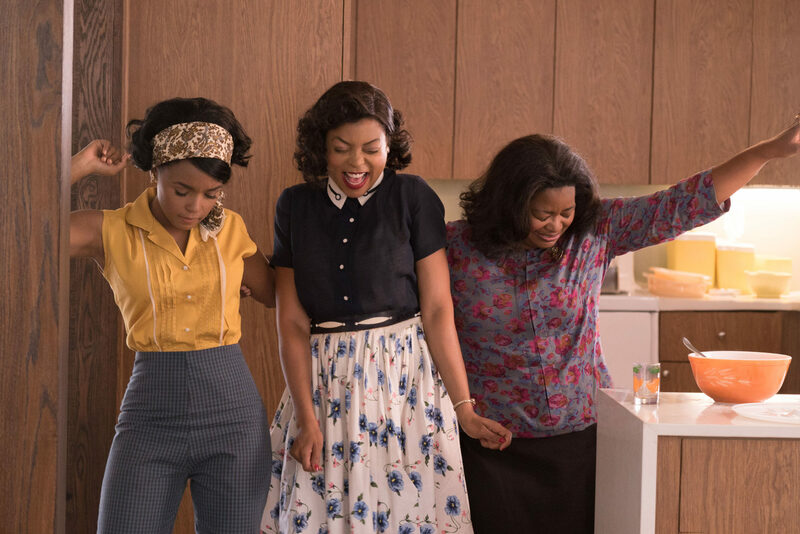 Taraji P. Henson as Katherine, Octavia Spencer as Dorothy, and Janelle Monáe as Mary. Oh, and NASA. No, not the people in NASA, but NASA itself. Each woman has her own personality and her own story arc, complete with her own barriers to overcome. Each woman has her own personal life outside of work and, to my surprise, these three are the only ones who are shown with families and love interests. These scenes don’t dominate the movie, either; there are just enough for you to get a sense of their lives at home. And while there are white supporting characters, they are exactly that: supporting characters. There’s no scene where a white character goes back to their cushy home life to contemplate the discrimination these black women have to deal with in the workplace. There’s no white savior who magically ends racism for the sake of the mission. 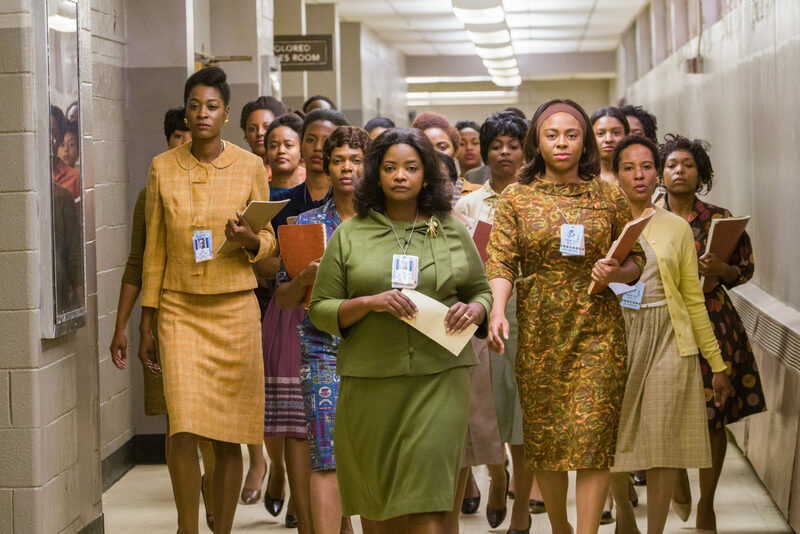 Instead, there are several scenes in which it dawns on the white NASA employees that these black women are necessary, and that in order for them to do their job, they have to stop ignoring the segregation and let them in. But they aren’t the ones who put a stop to the discrimination: these black women demand it. You want that man to orbit the Earth? Give us the clearance we need or he can stay on the ground. And it’s not just the white cast that’s been relegated to supporting character status. Black men also play second fiddle to the leading ladies and are, for lack of better words, love interests. While this is perfectly illustrated with Jim Johnson, Katherine’s love interest, I was more impressed with Mary’s husband, Levi Jackson. He doesn’t have much screen time, but when he is on screen, he worries about his wife as she tries to advance her career. He’s got good reason to worry, of course, since this takes place in a time when we couldn’t even share the same coffee pot, but to see a black man in the supporting spouse role in a film brimming with segregation and oppression? While a black woman takes center stage? Yeah, Hidden Figures just did that. One of the most refreshing things about this movie is the friendship between the three women. They support and believe in each other, and they build each other up when it feels like the rest of the world is against them. The friendship, to me, is also an honest one. When Katherine and Mary get their new assignments, there is a moment when Dorothy is upset—she’s been acting as a supervisor for over a year, yet she’s never given the title. While she’s happy for her friends, she makes a comment about being frustrated over not being given the promotion she has worked so hard for. Her friends don’t criticize her for her feelings for putting a damper on their success. They agree with her sentiment and know that she’s not being given the respect she deserves. Speaking of which: black women being allowed to feel. More of this, please! This support system goes beyond the three main characters, too, as Dorothy insists on the betterment of “her girls.” There’s a room full of black women who get various assignments at the space station, and Dorothy looks out for all of them, not just Katherine and Mary. When one woman moves forward, the rest move with her, and NASA really has no choice but to let all of these women come in and do their job. You know when you watch a movie with a nerdy female character and the handsome love interest comes to sweep her off of her feet? Or rather, he would if she weren’t so gosh darn nerdy. Women folk shouldn’t be talking about that there math. She should take off those glasses and make a sweet potato pie for her man! Or she can proudly proclaim her intelligence and keep those glasses on. 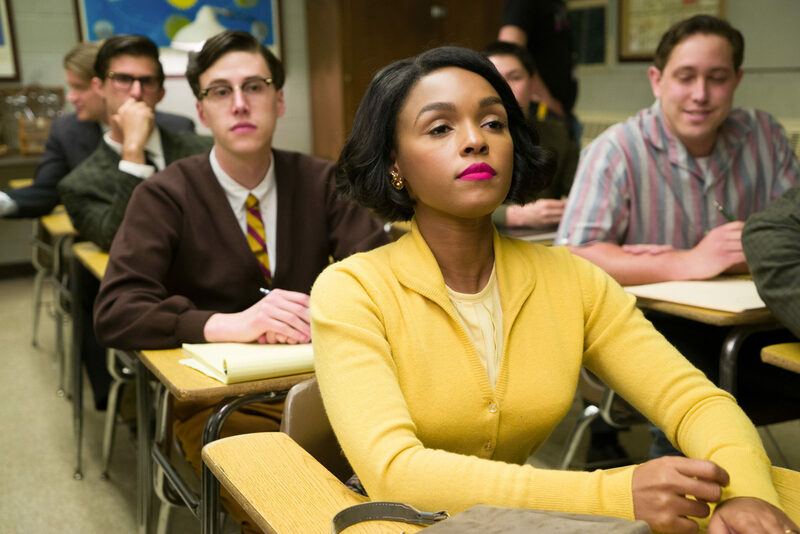 In Hidden Figures, not a single woman changes who she is for the sake of someone else, professionally or personally. If anything, other characters have one of two options: accept them as they are or don’t have them at all. And no one tells any of the women to change who she is—there’s no scene in which a woman’s “friends” tells her to stop with all the math talk, stop working so much, and focus on getting a man. There’s no one giving a speech about these women being too focused on work. There’s no one shaming them for working long hours while a husband or grandmother watches the kids. They’re allowed to be themselves, and they’re praised for doing so—even the black church takes a moment to applaud our three heroines in the space program. The message is clear: they’ve chosen this path in life, and they’re going to see it through. I already mentioned how black women are magical, but when some people realize our wonderment, they interpret it as us being superhuman. It can certainly seem like that, but the truth of the matter is this: we get tired, and we have a breaking point. Not that we’re ever allowed to show it. Black women are expected to be a lot of things, and those things can, on occasion, conflict with one another. Be strong, push through the hardship, and do the absolute most for yourself and other people . . . just don’t do too much. You have to be approachable, you know. Don’t rock the boat, don’t try too hard, and remember to stay in your lane. What is labeled as “strong” to some is labeled as “bitchy” to others. When we’re given opportunities, we have to give our all, even if our all isn’t given the respect it deserves. We have to smile through it with no hint of complaints, because complaining is rude—we’re lucky to even have these opportunities. This movie illustrates all of that. These women have clear goals, but they are also painfully aware of the state of affairs in the world. Yes, they’re lucky to be given the opportunities they’ve been presented, but there’s a very real moment with each of them that I feel we need to keep in mind whenever someone tells us to just be happy with what we have: they weren’t given anything, they earned it. We’re taught to be humble and appreciative, but there’s a major difference between being thankful and being complacent. This movie has a very real lesson of being proud of your accomplishments and not settling for less than what you deserve. It’s a slow buildup, because we all fall into the “be happy” trap, which is brilliantly illustrated with the time period this takes place in. A black woman in NASA? Such a thing was unheard of—so she should just go with the flow and keep running half a mile to the colored bathroom since her new department doesn’t have one. She’s lucky to even be there. But, eventually, we have to make them realize that they have to make room for us, especially if they want a shred of our magic. Of course, anyone who bothers to pay attention to, well, anything would know that this is a false statement. But that’s the thing: there are an alarming number of people who refuse to open their eyes and see that. To them, things aren’t that bad because, hey, we get a day off in January for MLK and there’s that whole Black History Month thing. What they don’t realize—or, in many cases, refuse to realize—is that their willful obliviousness is not only adding to racism, it’s making it worse. It’s one thing to have to deal with an all-out hatemonger who tells us to go back to where we came from, but that one coworker who turns the other way at our discomfort? That’s a dangerous norm that we need to step away from. And it’s exactly what these ladies have to deal with. 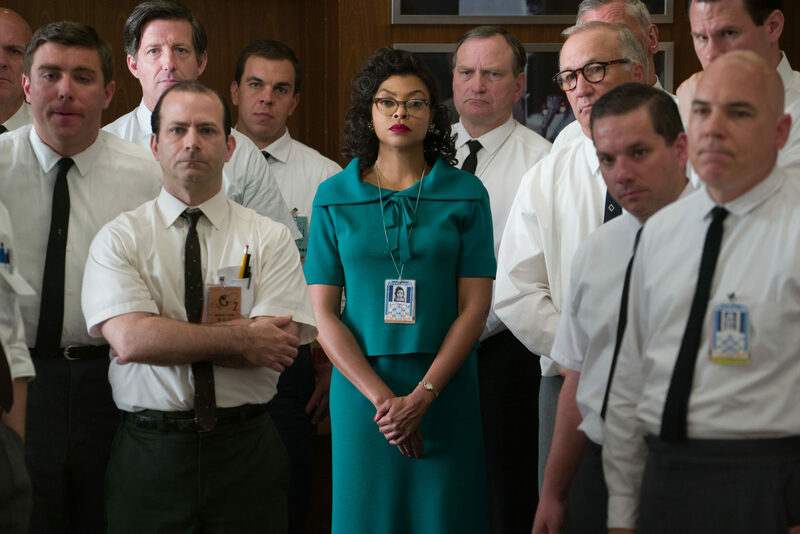 What really affected me was the variety of obliviousness in Hidden Figures’ white characters, and the fact that they had segregation to back them up. Head engineer Paul Stafford has a clear dislike of Katherine, and while his other coworkers will just give her a dubious stare when she dares to drink from their coffee pot, he’ll say what they’re all thinking: that this is no place for a woman, especially a woman like Katherine. Then there’s supervisor Vivian Mitchell, who won’t give Dorothy her due props—but hey, it’s not like she’s doing it on purpose. It’s the higher-ups who won’t see things her way. It’s the country that’s pro-segregation. Vivian takes a dismissive “can’t help ya” stance because it’s not her problem to deal with; it’s just the way things are. Several characters take this position, because why let a black woman use their bathroom if the law says otherwise? Even if they’ve asked this black woman to assist them, they surely can’t give her a nearby space to pee in, right? Even the director of the space program falls victim to this. He seems like one of the only people who doesn’t care about the color of Katherine’s skin; all he cares about are the numbers, and as long as Katherine is producing them, he’s fine. But just like the others, he doesn’t think about her struggles. She disappears for long periods of time and he doesn’t bother to ask why—not right away, at least. Who cares as long as she turns in good work? It never occurs to him that she might not have the basic necessities, that she’s been pushed aside by the team she’s supposed to be working with. It doesn’t matter to him until she makes it matter to him. And there are no half-hearted apologies. There are real actions to show that the team finally understands. An apology is useless if you don’t back it up with proof that you’ve learned your lesson, and these characters do. As a geek, I yearn for the day when I can get black, female superheroes on the big screen. I want them in starring roles, and I want them to be well-rounded characters who are absolutely necessary to everyone they encounter. I feel like this movie has given me what I’ve been wanting since I discovered Storm when I was nine years old. Storm was a small taste of something I hadn’t realize I needed until then, but Katherine, Dorothy, and Mary? They are the main course, and hopefully, more women like them are introduced to young black girls who may be wondering whether they’re “black enough” because they don’t fit into the nonsensical image of what people think it means to be black. But it’s not just black youth who benefit from this movie. It’s women my age, and especially women my mother’s age who saw the launch happen, in real life, because now they know the story. Now they know that women like them were a part of it. The way representation should work is that you represent all aspects of a group. This should include successes beyond surviving the master’s whip or serving the well-dressed white lady. There are plenty of black women who are successful, and who’ve gained that success through their own merits, not after a cheating husband or, in the worst-case scenario, a murdered one. There are plenty of black women whose successes are shoved to the side, their stories untold, in favor of the same repeated narrative of the full-figured house servant or the wife of a man who is leading a movement. We deserve to have our successes highlighted. We deserve our time to shine because of our own magic. It’s about time those figures stopped being hidden, because they’re important.